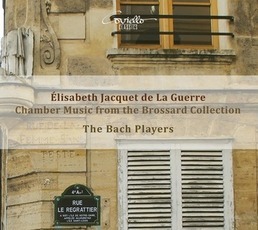 Élisabeth Jacquet de La Guerre (1665–1729) is often introduced as a ‘woman composer’, but as the music here shows, she transcends any category. Her work displays drama, intensity, and great artistic subtlety. No wonder that Évrard Titon du Tillet in his Parnasse français (1732) gave her a place on Mount Parnassus alongside Lully, Marais, Louis and François Couperin. A child prodigy, as a teenager she enjoyed a place as a harpsichordist in the court of Louis XIV. Later she composed works for public performance, including ballet, opera, and cantatas, as well as more private chamber music. The Bach Players present all the music by Jacquet de la Guerre that was copied by her contemporary, the composer and theorist Sébastien de Brossard (1655–1730): four trio sonatas and two sonatas for violin and continuo. This is a first recording for these pieces as a set. Also here are four of the ‘unmeasured preludes’ for harpsichord that she published in her Pièces de clavecin (1687): apparently improvised and compelling works. 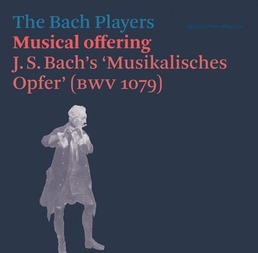 The complete set of twelve Bach Players’ CDs can be bought for a much reduced price of £100 (bought singly they will cost £162). Designed to form a series, and in distinctive card packets, they occupy less space and are noticeably lighter in weight than a row of conventionally plastic-boxed CDs. When J.S. 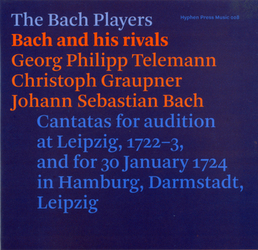 Bach was given the post of Kantor at the Thomasschule in Leipzig he joined a long line of musicians in this position, among them Schein, Schelle, and Kuhnau. 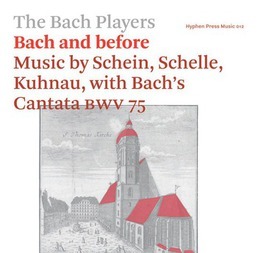 This disc provides recordings of their treatments of texts that Bach would also set, and demonstrates the extraordinary strength and beauty of German church music of those times. It concludes with the first cantata that Bach wrote after his Leipzig appointment. ‘Die Elenden sollen essen’ is a master-work, notable for its virtuosic trumpet part. This is a show-piece, and a fitting debut for his work at St Thomas’s. Behind J.S. Bach stood Dietrich Buxtehude, the pre-eminent German composer of the seventeenth century and now unfairly neglected. 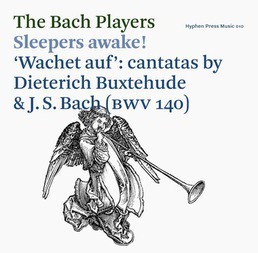 In this recording The Bach Players reunite the two composers, featuring their settings of the text ‘Wachet auf, ruft uns die Stimme’ (Sleepers awake! The voice calls us). The text uses the parable, from Matthew’s gospel, of the wise and foolish virgins at the wedding feast. One of Buxtehude’s settings (BuxWV 100) is remarkable for its four violin parts, used as if they were trumpets. Also on the disc: Buxtehude’s glorious chaconne-form sacred concerto ‘Quemadmodum desiderat cervus’, for solo tenor voice and two violins, and a trio sonata for two violins, viola da gamba, and harpsichord. A sonata by Erlebach gives us the chance to hear the piccolo violin, which Bach deploys in his ‘Wachet auf’. 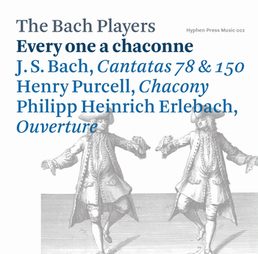 As always in the Bach Players’ recordings, the sequence of pieces is imaginatively conceived and full of variety. Hear how the Italian ‘stylus fantasticus’ crossed the Alps to the centres of Habsburg culture, then on north to Hamburg, with music by Valentini, Schmelzer, Weckmann, and others. 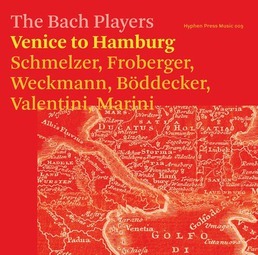 ‘Venice to Hamburg’ centres on pieces for an unusual combination of instruments – violin, cornetto, sackbut (trombone), dulcian (bassoon), and basso continuo – improvisatory in character, and jazz-like also in the way that each instrument is in turn given a solo spot. A warning: this CD contains ear-worms! In France at the end of the seventeenth century Corelli’s influence was enormous. The more rational, formal French style had been dominated by Lully; French composers had to admit secretly to liking the more emotional Italian style. This rich banquet of private music composed for Louis XIV shows the first experiments in France with the Italian style. The disc concludes with what has been claimed as the first French sonata, an extraordinary work composed by Charpentier for eight instruments. This is a selection of pieces that J.S. Bach had in his library and which provide a context for his celebrated Orchestral Suite in B minor. Some of these works J.S. Bach copied in his own hand (Dieupart, Johann Bernhard Bach, and Steffani), and one exists in his brother Christoph’s hand (‘Alcide’ by Marais, in arrangement for harpsichord). 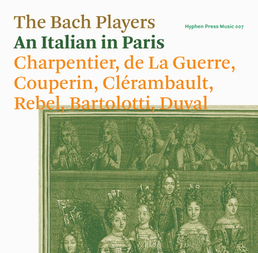 The Bach Players provide a perfect entertainment and throw light on the importance of the French style to J.S. 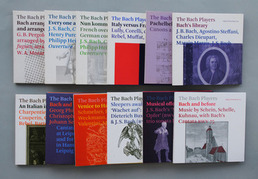 Bach and his German contemporaries. Italian or French? Jean Baptiste Lully and Arcangelo Corelli were the champions of these two musical styles – and the main subjects of the many attempts to establish which style was better. Or could the two styles be united? This programme paints a musical picture of the later seventeenth and early eighteenth centuries in Europe, through the music of Corelli, Lully, and their contemporaries. Chief among the reconcilers was the organist and composer Georg Muffat. German but of Scottish ancestry, it was he who introduced both styles to Germany. 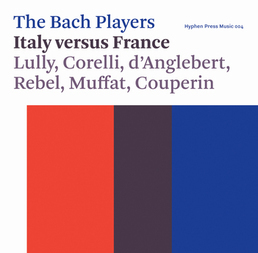 Also included are Rebel’s homage to Lully and Couperin’s to Corelli. 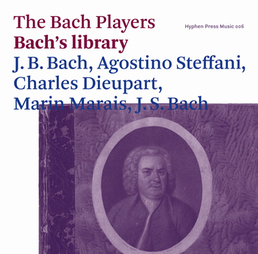 In this vivid recording The Bach Players bring history to life. 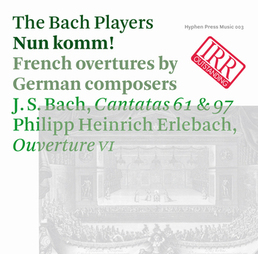 The Bach Players explore the form of the French overture in two cantatas by J.S. Bach: the thrilling Advent cantata ‘Nun komm der Heiden Heiland’ (BWV 61), from his Weimar years, and ‘In allen meinen Taten’ (BWV 97) from his later years in Leipzig. They play a dance suite by Philipp Heinrich Erlebach, opening with another French overture. To complete the disc, Heinrich Isaac’s beautiful ‘Innsbruck ich muß dich lassen’, which provides the choral melody for cantata 97, is sung a capella, and is played in two instrumental settings. This programme is centred on the chaconne: you will hear how Henry Purcell and J.S. Bach join hands in this much-loved dance form of the seventeenth and eighteenth centuries. Of the few works of Philipp Heinrich Erlebach that survive, we perform a suite that concludes with a chaconne. 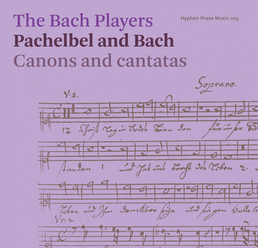 The two Bach cantatas are contrasting: BWV 150 is said to be Bach’s earliest surviving cantata, BWV 78 was composed in Leipzig at the height of his career. What happens when great composers arrange each other’s works? J.S. Bach gave Pergolesi’s Stabat Mater a new text and a new viola part, making a fresh piece that speaks both of Germany and Italy. This performance features singers Rachel Elliott and Sally Bruce-Payne. 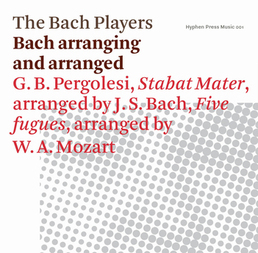 Mozart gave string players the pleasure of playing fugues from the Well-tempered Clavier II – fresh arrangements by The Bach Players complete the set of all the four-part fugues from this work.